#procjam is a jam about making stuff that makes other stuff - come and join in this November with a relaxed, friendly jam, free tutorials and art packs to help you get started, and a great community! Find out more at www.procjam.com. #procjam just has one rule: Make Something That Makes Something. That means we experiment with generative techniques, from rolling dice and picking things from lists, to using the latest ideas in technology to make complex and weird things. But you can enter anything into #procjam! You could make an art piece, a toy, a tool, an experimental prototype, a full videogame (or boardgame! ), a meditation aid - anything you can think of! Whatever you make, let us know what you're up to! Tweet with the hashtag #procjam and don't forget to submit your work to the jam using this page when you're done. Find us on Twitter and our official website! You can start early, or finish late. The dates are there really as guidelines to let you know when other people will be jamming. Some people can only work on weekends, some people can only take an evening here or there. Last year I spent four weekends instead of jamming through the official days. Do what works for you - let us know if you need a late submission code. If you think it's a #procjam entry, it is. Don't worry if it's a game, or if it's really art, or if it's 'proper' procedural generation (that doesn't exist). If you made something and want to share it with us, please submit it! We love physical entries. We've had paper-and-pen entries before, so don't feel left out if you have a non-digital idea! itch.io will still accept the submission too - send us photographs or printouts! Every entry has a place here. Some people submit complex works of art that they needed decades of experience to create. Other people submit their very first procedural project here. Our community is friendly and welcoming, and we're excited to see everything that you make! Every year we release free art packs to help people make beautiful things. Our 2017 art packs - by @cryoclaire242 and @devilsgarage - are now available! You can find them along with our previous art packs, over on our art page! Brand new for 2017, we're funding four tutorials about generative software, covering topics like music, literature, and cool new techniques like wave form collapse and answer set programming. These tutorials will also be translated into other languages too, thanks to our kind Kickstarter backers! We have two tutorials released so far, with two more to come. 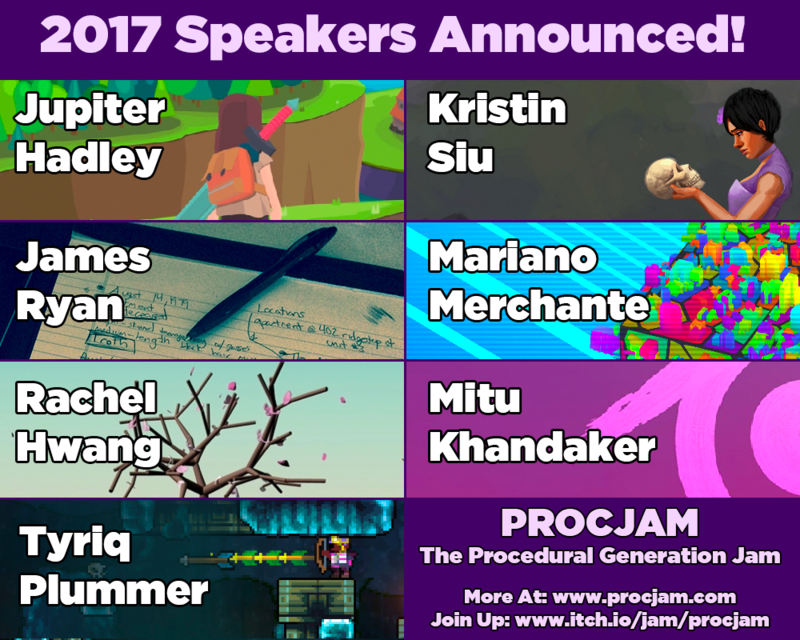 Our 2017 speakers have been announced! Every year we have talks from people in and around the generative community. This year we're not having a live talks day, but we are putting a huge bunch of great talks on YouTube, with a live premiere during the jam. Read more about this year's speakers here, or check out our previous years' talks on YouTube? Seeds is the official zine of #procjam! Last year we published over 100 pages of art and writing from community members, and this year we've had loads of submissions ready to go into Issue 2. We'll be releasing it close to the jam! Read Issue 1 here. While you wait, why not take a peek at PROCJAM 2014, 2015 or 2016? Toy Town is a 3d-visualizer for Medieval Fantasy City Generator. The 3D maze screensaver is back! Oh no, no, no. But also: yes yes yes. Demo of my procedural algorithm for generating Dr Seuss-style fantasy / sci-fi trees. Prototype/early build of game that is supposed to represent the struggles of life and balancing act of priorities. ProcJam 2017 entry. Plant seed in your mountain garden. Save a screenshot for posterity. A labyrinth generator inspired by the Etrian Odyssey games. Psychedelic kaleidoscope made with Processing. Created for the 2017 ProcJam. Fight procedurally generated eldritch creatures in the Outer Ring! [ProcJam] Very humble and simple space ship room generator done during the ProcJam 2017. Enjoy !! Explore procedurally generated islands while searching for strange treasures! You have the power of the gods. Manipulate terrain, burn trees, create rivers or lakes, use your powers to smite foes! Take 3 minutes to reflect and watch the mountains grow. A Map Generator that uses binary divison to create a map and then use node-based placement to place connecting doors. A quick experiment for Planet Generation for PROCJAM 2017.
edit the grid code to make your own little patterns, great for screensaver stuff I guess. A tool to generate viable looking n-body 2D planetary systems. Defender clone with procedurally generated graphics. A program that makes a curving line that can branch off into other lines. Made as a very simple entry for Proc Jam. Interactively generate tiling vector cities. Explore a procedurally generated dungeon and use random spells to destroy enemies. A 2D RPG map generator using PCG concept with support to different terrains and smart autotile algorithm. It's like Nested but with graphics. A procedurally generated tower defence. Combine and battle as many monsters as you can! Escape from the infected city or die trying! Protect yourself from dangers such as meteors, acid rain and hellish flames! A classic pen-and-paper style maze created right in front of you! Not sure what you want your next yarn pattern to be? Use this to help! A Twitter bot that models islands in Blender. The happy bot social network! A procedurally-generated short story about cryptids. A procedurally generated platform running game! A simple language for making vectory, fractaly art. Tiny fairy tales to lighten up your day. Toots twice a day. Will be queered up soonish. A twitter bot broadcast of strange documents found in the footwell of an abandoned Ford Taurus. A tool to create 3D mesh with code ! Randomly applies forces to rip apart a block of "jello"
Help Hubble explore the dungeon with the power of typing. Generates small heightmaps with territory boundaries based on the name you give it!